I had a very intense and stimulating time teaching a module this weekend to MBA students at UNICAMP, one of the most highly regarded universities in Brazil. I had been invited by Prof. Dr. Ruy Quadros, the country’s leading academic expert in innovation, who had asked me to talk to his students about the relationship between chaos and complexity theory, innovation and creativity. The course I gave began with an examination of mental models, and the evolution of mental models in the history of science. In the second half of the morning we looked at a number of examples of complex systems in nature and how different companies such as Gore, Toyota, VISA, and Kyocera can gain a competitive advantage in innovation by applying this system thinking in their business models. When we look at what makes these companies so innovative, it is not just their non-traditional structures, such as Gore’s lattice hierarchy with no job titles, or Kyocera’s Amoeba Management System. An integral part of the cultures of these companies is trust, respect and in Kyocera’s case “respect the divine and love people”. In 2007, Epoca Negócios in Brazil published an article “Why is Brazil so bad at innovation?” and in this article was research showing the percentage of people in various countries who trust other people. If you look at the chart below, Brazil is down there at around 6%. 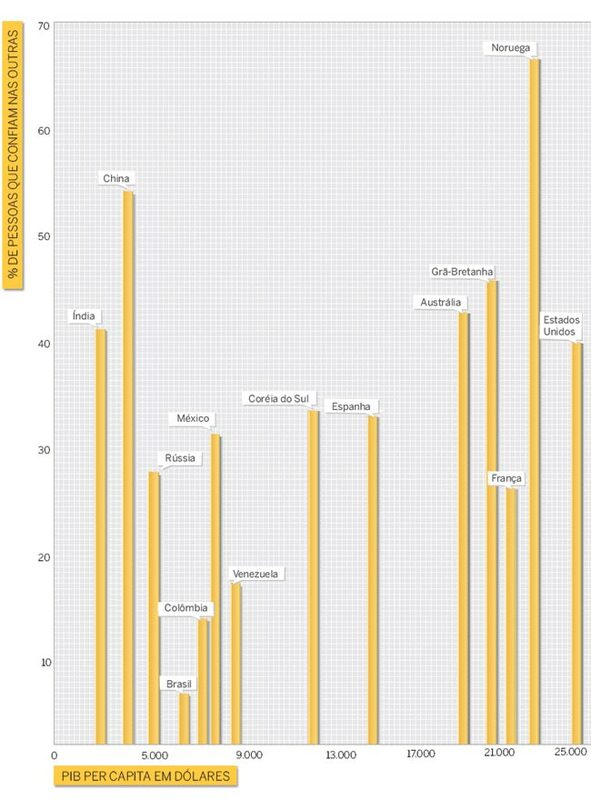 The 2012 Global Innovation Report places Brazil 58th out of 141 countries in their general ranking table. Maria and I often discuss a lot just why Brazil is such a poor performer when it comes to innovation, and there are many cultural and social factors of course, but in order to innovate you have to be able to share ideas, and if there is no trust, then this sharing will not take place. At the end of my course I gave the students a complex issue to tackle, and one that is now affecting all of their organisations. This issue is education, and Brazil will find it increasingly difficult to remain competitive when the overall educational results are so low. I asked the students to focus on the problem of computer literacy, and how this could be rapidly improved in the coming years. Many of these are culturally difficult for Brazilians, where the norm in a conversation is more about winning at any cost, and also avoiding any sense of embarrassment or failure. This is very different to some of the top design agencies around the world where the motto is “fail often”. I really wanted to see if the students could experience for the first time the honouring of others’ mental models, with aim not of changing opinions, but to see if a creative solution could emerge naturally from the greater meaning of the sum of all people’s perspectives, views and ideas. As was expected, everyone tore into this exercise generating a huge volume of energy and discussion for the next half hour or so. It was fantastic to hear both the various solutions proposed, from using smart phones and recycling computers, to the educational programmes suggested. Also it was not unsurprising that one group still did experience the competition to be heard in the discussion, showing that a real conscious effort has to be made at dialogue, and in intensely competitive corporate environments this is not always easy and is not natural. One educational programme that Maria has been involved with for the last year or so comes from India, where the emphasis is on teaching human values. She showed me this video which although is from 1998, is still as relevant now as it was back then. The number of educated in Africa, the number of men and women who have been educated in Africa has so increased there is no lack of educated people. You can not say there are no educated people in Africa anymore.The reins of government in this country in Africa are in the hands of “the educated”. The economic systems are managed by the educated. Even the military services in Africa are managed not by the illiterates by by generals who have been to colleges. The cicil service is also managed by them. Indeed all kinds of human endeavours in Africa are in the hands of the educated African. And yet, in spite of this, we still have these problems. In fact these problems seem to increase at an alarming rate. Who then is the cause of these problems? Let us not do what we always used to do and attribute these problems to our colonial master. These times have gone. If we ask the question who is responsible for these problems, the responsibility must be placed properly at the feet of the educated African. Not the people who live in the villages and in the bush and who are happy with what little they have. That education we received early on did not prepare us sufficiently for the task of nation building. That education placed great emphasis on the development of the intellect, on academic excellence. As Carl Sagan said, academic ability is no guarantee against being dead wrong. What I am trying to teach is a new business thinking, inspired by nature, where a study of the dynamic organic complex systems in nature can lead to a radical transformation of our mental models. Creativity can thus be nurtured in organisations through creating the right conditions for true dialogue. But this alone is not enough to solve problems, be them strategic ones in organisations, or social and economic problems in our countries. We need human values too, and when these are in place in our organisations and societies, real innovation can flourish, with creativity which is in tune with nature, and not destructive towards nature.